Could PEO pave the way to more successful implant treatments? The very first titanium dental implant was placed in a human in 1965. Since then, titanium-based implants have become a staple of modern medicine – they have used millions of times throughout the human body. One of the most compelling features of titanium is its natural biocompatibility: we’ve long known that titanium and titanium compounds are generally non-toxic (for example titanium dioxide is used in many foods), and developments in the 1960s discovered that animal cells adhere well to implanted titanium. Despite recent medical advancements, failure rates of implants remain quite high. More than 1 in 20 dental implant treatments fail, and recent research has highlighted the critical role that surfaces play in determining the success rate of implants, in particular how they can influence osseointegration outcomes. Osseointegration describes the process of adjoining living bone and tissue with a foreign material. For an implant treatment to be deemed a success, the titanium implant must exhibit bone adherence and provide a certain level of mechanical stability. Surface properties fundamentally impact the behaviour of these cells, which can alter the speed of cell propagation and the mechanical stability the implant exhibits – both critical success factors in the short- and long-term success of a treatment. 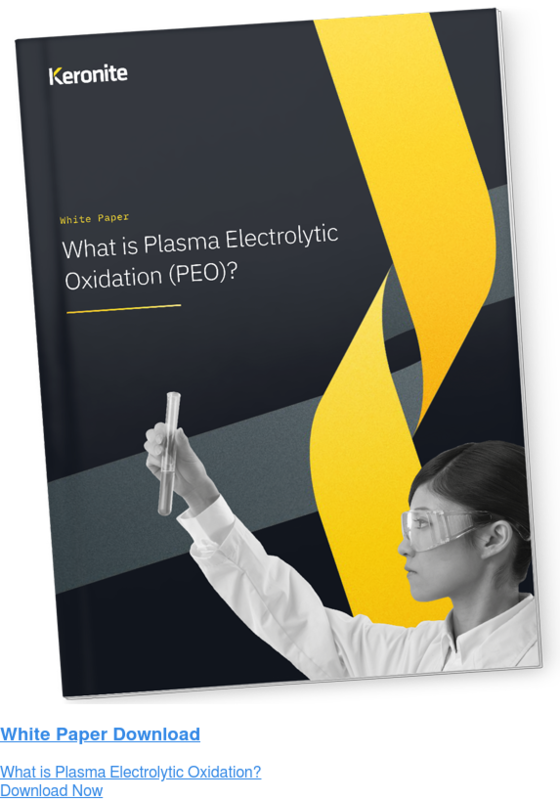 Following several years of developments, Keronite scientists have engineered surfaces using plasma electrolytic oxidation (PEO) that act as excellent substrates for cell growth. These recent have highlighted ways to increase the speed, success and long-term viability of these treatments. Put simply, it’s a matter of metallurgy. Titanium offers a great deal of biocompatibility, as it is both non-toxic and contains a low modulus of elasticity, which closely matches the characteristics of bone. Furthermore, titanium naturally offers high strength and impressive levels of corrosion resistance. However, surface coatings can be used to modify & improve the characteristics of titanium, which Keronite’s scientists have found to accelerate the propagation of cells and lengthen the useful life of implants. Porosity. A naturally porous coating provides ‘scaffolding’ for cell growth and tissue implantation, which aids in the acceleration of osseointegration. Porous structures at a sub-micron level provide an ideal environment for cell proliferation. Roughness. Surface roughness stimulates cell migration and leads to better osseointegration. Non-toxic. Surface coatings that accelerate osseointegration need to be inorganic and free of toxic materials. Hardness. When damaged, the natural corrosion resistance of titanium reduces, which makes a hard surface coating essential to the long-term success of an implant. Meeting all of these requirements simultaneously is a huge challenge which means that the options for suitable surface coatings are incredibly limited. This has restricted the enhancement of medical titanium materials. However, Keronite’s scientists have been working closely with the industry to develop a high-performance PEO coating that delivers the type of surface characteristics that promote better osseointegration. Cells in the human body have evolved to become highly sensitive to foreign objects. Scientists have been closely examining methods to accelerate cell proliferation and long-term success of implant treatments. PEO technology transforms the surface layer of titanium into ceramic oxide coatings. The tightly controllable methodology enables Keronite’s scientists to create bespoke coatings, with customisable properties such as pore structures. The coating has been widely tested, in both in-vitro and in-vivo studies. In one study, the application of PEO on a titanium dental implant increased the necessary removal torque by approximately 160% within just six weeks. Given the extremely attractive combination of porosity, good mechanical properties and biocompatibility that PEO provides, there is significant potential to improve the success of medical implants. Keronite has extensive experience of modifying the PEO methodology to enhance materials, modify the composition and structure of coatings for particular applications. Our scientists are currently working with several biomedical manufacturers to launch new coatings offering accelerated osseointegration and high mechanical stability - all from a non-toxic, inorganic coating solution.